I was wondering whether or not it would be a good idea to take my two toddlers on a cruise. I did not know if there would be enough for us to do to keep them busy without driving me crazy or having to spend most of the time hanging out in the pool. I was happy to find that their program for kids was geared to be age appropriate with a ton of fun things for the family to do together and for the kids to do in a parent free zone. It turned out that we did not need to use the “sitter-service”, but it gave me piece of mind to know that it was available. We did, however, participate in the family fun activities they had daily. Our favorite was the Halloween parade and candy scavenger hunt. 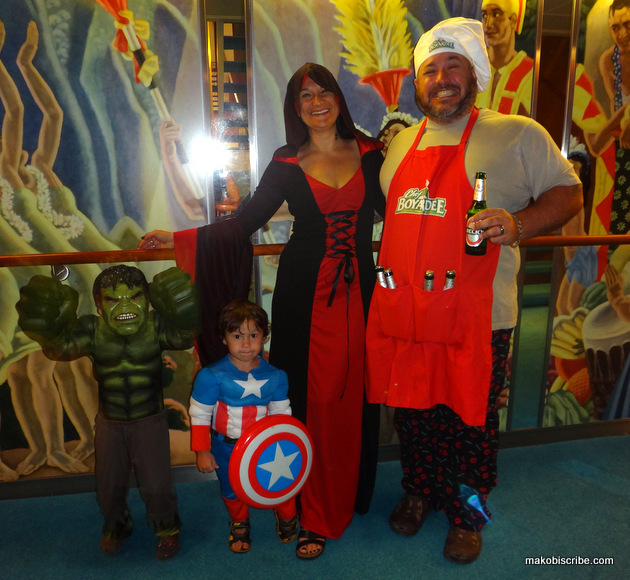 We all dressed up, and we were the hit of the ship! My kids had to stop often to take pictures with admiring passengers from all over the world. My son, Jakobi, and I always wake up early. So, we went downstairs before every one was up and enjoyed some mommy-son time. I needed my coffee and he likes our time together so it was perfect. I grabbed some juice for him and a few slices of melon and we planned what we wanted to do for the day. After I woke up from the coffee, I realized just how cold it was on the deck of the ship in October! If you are planning to be Cruising To The Bahamas In October, bring a light jacket for the winds. I was freezing and Jakobi had two shirts on! I should have realized it was so cold and planned the rest of the day accordingly, but I figured it was the being on the sea on a really high boat that made it cold, and not the fact that winter was coming and we were on the tail end of a hurricane that passes through. Needless to say if you are cold, bring a jacket! We went back to our cabin and grabbed the rest of the crew for breakfast. Of course, we could not leave until the kids took a gander out the window. They were really excited about seeing all of the other boats. We had learned that our third port of call was going to be cancelled because hurricane Sandy came through and wrecked the island. I was not too upset because I was actually wanting more ship time anyways. There was so much to do, I honestly was resentful for the ports of call messing up my day at sea experience. We moseyed on down to breakfast and the buffet was incredible. There was something for everyone to eat. I had hard boiled eggs so I could stick to my diet, while Mason had 8 sausage links and watermelon. Jakobi ate french toast with cheese while Daddy had eggs Benedict Billy sampled a bit of everything and I grabbed dry fruit loops to bring with us to Freeport along with chocolate milk for the cabin. After we finished our meal, it was about 9 and we went back to the cabin to change diapers, and pack the bag for the day. I brought dry cereal, money, keys to the boat, id, and baby changing stuff. I also brought Dramamine for me to take before re-boarding all in a bag big enough for souvenirs. Once we heard the all clear over the intercom, we waited a few more minutes before heading ashore. We did not want to get caught in the hustle and bustle of the crowds with two wandering, curious kids. We left about 9:30 and disembarked easily with no wait and no hassle. At each port we were met with a Norwegian character for a photo opp so we could capture our memories. 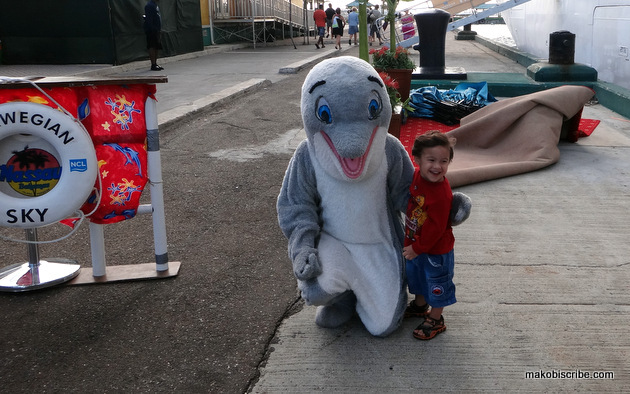 Mason was in love with the dolphin. Once you are on land there are a few souvenir shops and 2 bars so you can really just stay right there. The weather was freezing and windy so I knew I did not want to go to the beach. 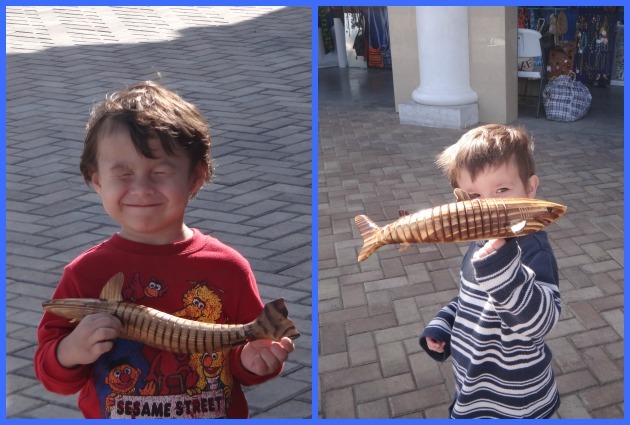 We took a taxi to Port Lucaya to shop the marketplace. It was 11 miles and the cab cost $5 per person. At Port Lucaya I got may hair braided as a token souvenir. It was $60 for half your head. It hurt like crazy, but was bearable. My kids shopped for conch salad and drinks while I was busy. The Bahamas is know for their conch dishes. My husband got a container…it tasted like the homemade ceviche that I make often and was incredibly good. We also visited a Starbucks to warm me up. The prices were a little more expensive (by a dollar) but same great quality and free Wi-Fi. My husband got a pina colada in a real coconut and the kids got strawberry smoothies. Word of warning – get plenty of napkins and bring wipes. They were messy. We stopped for lunch at a Greek Bohemian diner and ate inside because I was so cold. We ended up going back to the ship, and we got delayed at the bar for a while dancing to music with the other passengers. The kids had a blast, and I warmed up! 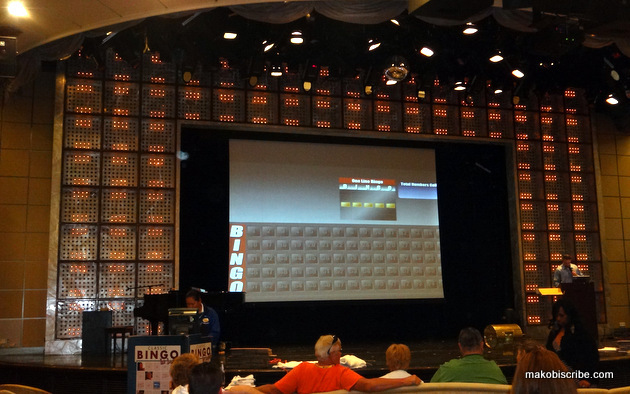 We played Bingo in the evening. You can see that it doubles as the Deal or No Deal set, which was a hugely popular game. We opted to listen to a James Taylor tribute. It was a great day! 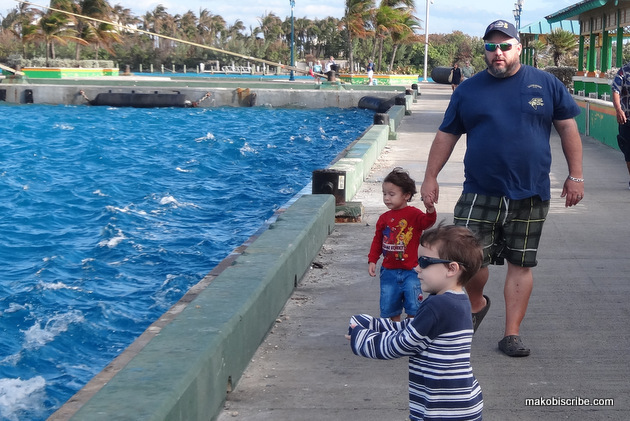 The next day we landed in Nassau, which to me, was a ton more fun! Look at the water. We spent a god half hour on the gangway just checking out the fish because the water was amazingly clear. As soon as we made it in through customs, we joined a local band! We traveled through the straw market. I thought the signs were kinda funny. What do you think? 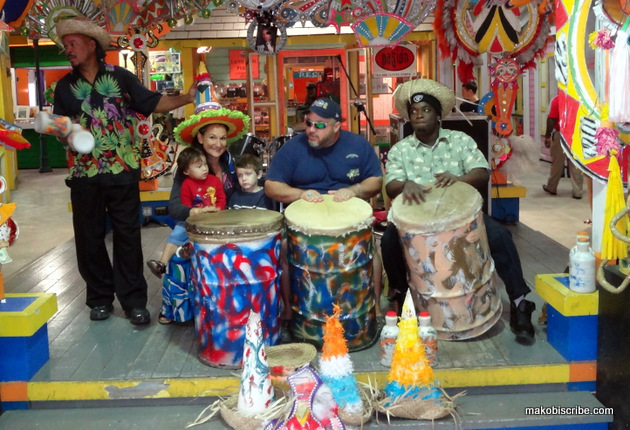 Everyone in Nassau was extremely friendly! We were approached by a ton of people to go on a horse ride or to go on a tour. I did not feel to overwhelmed though. One of the shop owners started talking to my kids about her wares which I thought was very smart marketing. Of course we ended up buying the treasures for them. On the way back, we stopped to take a picture with the boat. 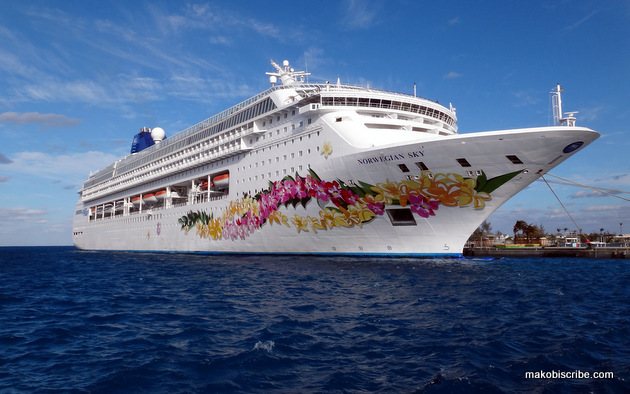 Look how the Norwegian Pearl towered over the other boat. Besides the size, I was really impressed with the service by the staff. They were very friendly and remembered our names (well our kids). I am not sure if that is because my kids are that great or Norwegian is, but either way it made for an awesome time for my boys. One of the nights, we were invited to an exclusive meet and greet with the Captain and his staff. It was nice to have one-on-one with the individual members and to find out about their personal experiences with the boat. 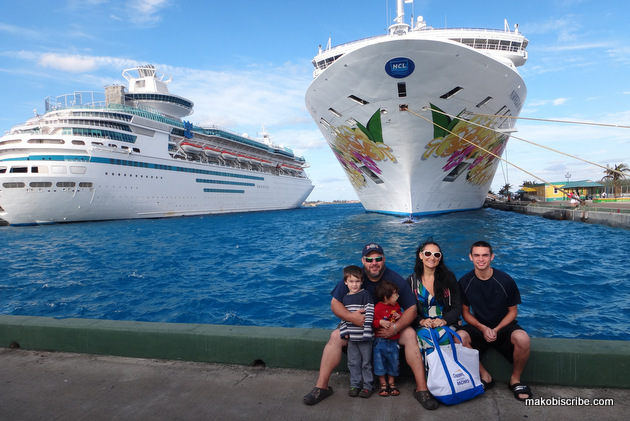 Sal and Joseph helped us decide our next cruise, and I am happy to say we took advantage of the put a down payment now and get $100 on-board credit. We gave that right back to the ship and then some at the casino, but we had a blast doing it. Our 5-year anniversary is coming up, and the husband and I are going to sail again. This time sans kids. We are going to go to the Western Caribbean with the following Ports of Call: Miami, Great Stirrup Cay, Bahamas, Ocho Rios, Jamaica, George Town, Grand Cayman, Cozumel, Mexico. Right now you can book for as low as $399 in the Spring. 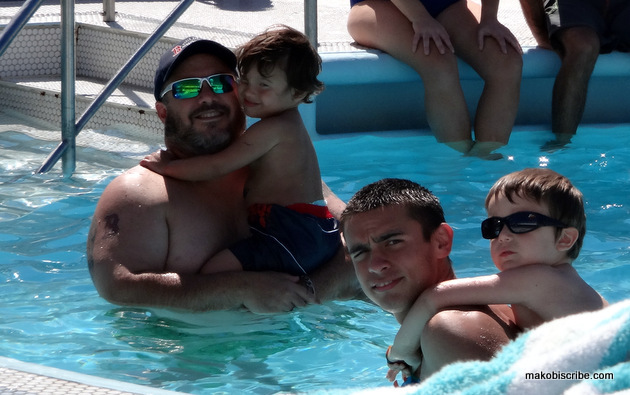 After all the walking around the Bahamas, this momma was happy to be able to relax poolside while the boys romped around. They had a poolside rum party and I was even happier. The cruise director had a few games for the passengers to join in, but my teen son played basketball during his free time. Well, when he did not have a monkey on his back! 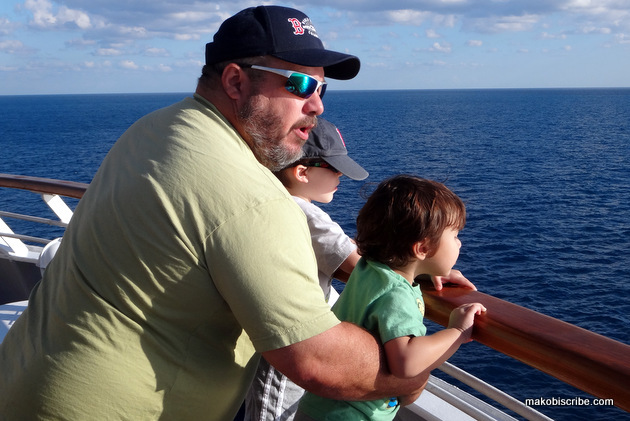 So, would I go on a cruise with toddlers again? Absolutely! We are planning on taking a Summer trip. Where should we go? 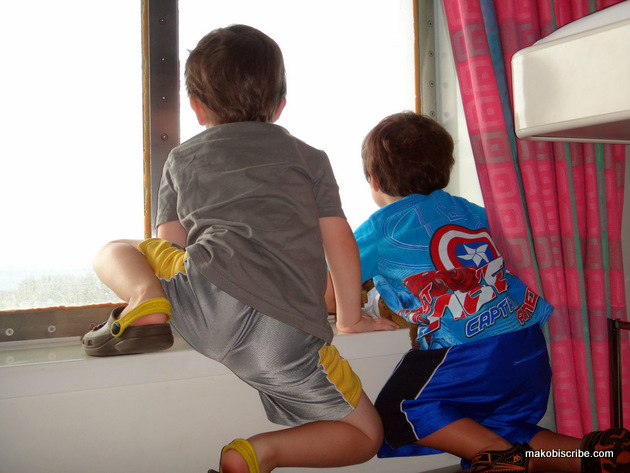 Have you ever cruised with toddlers? Do you want to? Where did you go? I just could not go away your web site before suggesting that I extremely enjoyed the usual information an individual provide in your guests? The crockery, cutlery and glassware are matching the interiors in the outlet. every wooden seam around the headboard, in addition to behind the headboard. not only a wine waiter a Sommelier can advise which is loads of knowledge for the best beverages. I’m totally admitting to being JEALOUS!! 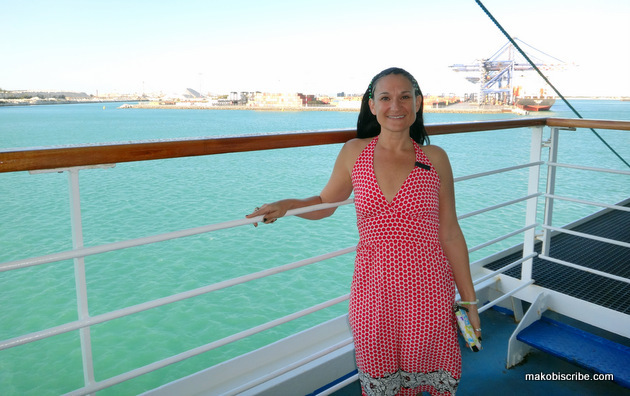 A cruise is one of the last travel things on the bucket list still to do! I don’t know if I would have been as brave to go with the small fry’s! They looked like they had a fab time! That looks simply amazing. I wish I was on that boat right now. Whoa, that’s a big boat! That pic almost looks like a back drop! lol What a fun trip! You just made me want to go on a cruise!!! 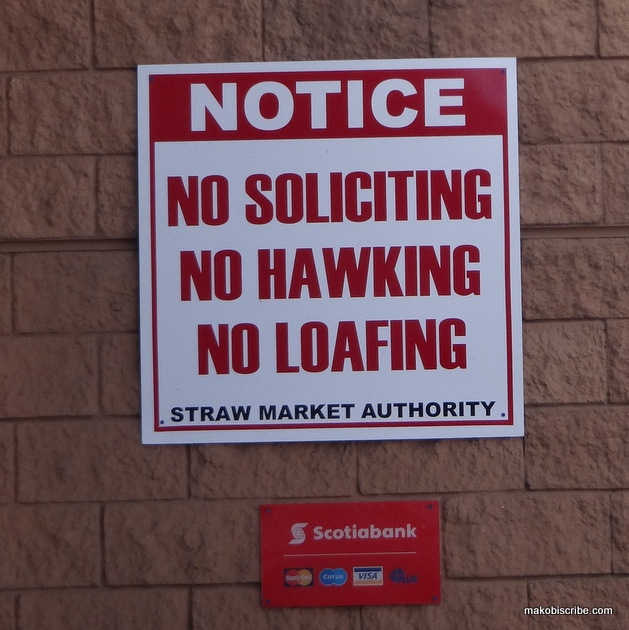 What the heck is hawking? Picking up small field mice and taking off with them? Glad you had a great time!